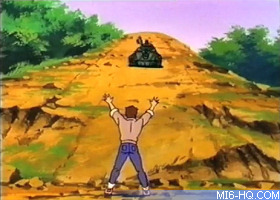 James Bond Jr and friends are out exploring the woods around Warfield when suddenly they are attacked by a battle tank. The driver turns out to be Oddjob. The steel-rimmed bowler hat wielding assassin kidnaps a student called Lotta Dinaro and takes her to the nearby airfield where S.C.U.M. load her onto a plane bound for the village of Puerto in Peru. 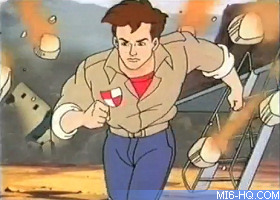 Young Bond and his friends decide to follow the plane in a bid to rescue the girl, but before they leave IQ packs a wristwatch that can fire a climbing rope, a video camera that can detect gold within a range of twenty miles, a couple of mini-explosives disguised as AA batteries and a homing device linked up to the watch. Shortly after they arrive, Bond's camcorder detects gold buried in the hills and so he goes to investigate while Tracy and IQ go look for a hotel. In Puerto, Tracy and IQ encounter 'mountain men', and the villagers are very quiet about whether or not they've seen a young woman from the city. 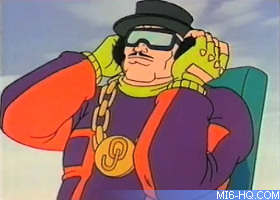 Whilst climbing the mountains, Bond spots Oddjob in a helicopter. Keeping out of sight, Jr shoots the homing device at the chopper with a sling-shot. Suddenly an ear-splitting noise vibrates through the land; creating a massive earthquake that not only leaves the town of Puerto in ruins, but also buries Young Bond in a mountain cave. Tracy and IQ survive the quake, and so have the goons they encountered earlier. Suspecting they work for Goldfinger, Tracy and IQ follow them. Meanwhile, using one of the explosives IQ gave him, Bond blows open the blockage in the cave but looses the other bomb in the rubble whilst climbing out. He follows the helicopter's signal all the way a valley where he discovers that Goldfinger is holding Lotta for ransom. Lotta's father is a rich eccentric who has spent his life searching for the lost city of El Dorado - the city of gold. Unless Lotta's father reveals Goldfinger the location of El Dorado he will test the power of his industrial laser on Lotta. The devoted father tells Goldfinger what he wants to know, but the villain has his own agenda. 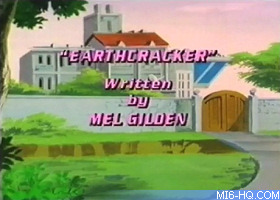 It is revealed that ever since Goldfinger's plan to raid Fort Knox was thwarted, he was secretly building a new weapon modification for his laser, code named 'Earth Cracker' - an ultrasonic generator powerful enough to bring cities to ruins, which he has already demonstrated on Puerto. 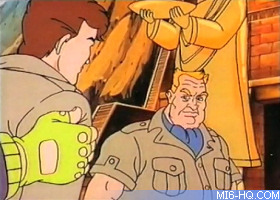 The villain uses the devices to excavate the ancient city hidden within a mountain. Bond watches everything hanging from a rope but is discovered and captured by Oddjob. Tracy and IQ pick up James' trail while following the guards, finding the battery grenade he lost earlier. They arrive in time to find Bond, Lotta and her father all placed in the giant bowl held in the hands of one of the twenty-foot tall statues guarding the city. 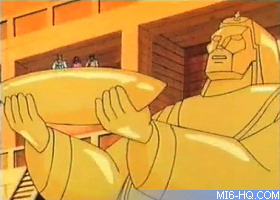 Using the giant laser, Goldfinger starts melting the gold of which El Dorado is composed. As the gold melts, it is put through a generator that turns the liquid back into solid bars of bullion, which Goldfinger plans to smuggle out of the country. At one thousand degrees centigrade he expects Young Bond to be burned to death. By setting off the remaining explosive up in the hills, IQ is able to distract the goons long enough for Bond to make an escape. He uses the piton and climbing rope from his watch to slide down to the bottom of the statue. 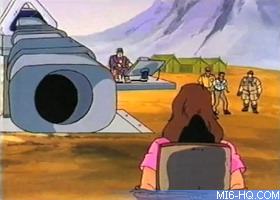 With the goons investigating the explosion, Young Bond manages to gain control of the laser. Oddjob tries to intervene, but Bond lasers his flying hat out of its path and then uses Earth Cracker to cause another massive earthquake once again burying El Dorado, along with Goldfinger and Oddjob. Mr. Dinaro is pleased that his daughter is safe, but sad that after all his years of trying to find El Dorado it is again 'lost' forever. All those years of trying to prove the cities existence down the drain, or so it seems. Young Bond has picked up a golden figurine from the crumbling city as a souvenir, which he gives to Lotta's father as a souvenir. James Bond Jr names his mule 'Moneypenny'. Goldfinger and Oddjob both appear despite meeting their demise in the 1964 film. Oddjob's attire has changed from a butler to an MC Hammer inspired purple jumpsuit. Lasers use amplified light, not ultrasound. Oddjob manages to grab Lotta with one arm despite being 12 off the ground atop his tank. Bond has to climb the mountain with ropes to reach the cave, but IQ and Tracy get there on foot. 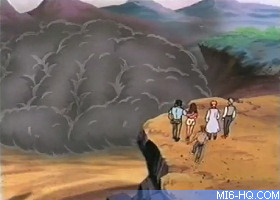 After the cave entrance is blocked by the earthquake, Bond clears it with an explosive battery, but then it appears blocked again when IQ and Tracy find it, only for it to appear cleared again a few seconds later. Goldfinger's accent shifts between Russian, German, English, and Spanish. Bond spends time filming Goldfinger and his operation despite being told by IQ that the augmented camera contains no tape for recording. 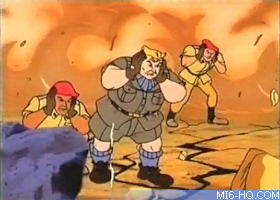 Goldfinger's goons throw the gold bricks between each other as if they weigh nothing. S.C.U.M. ship the mini tank to Puerto by sticking a large label marked 'Puerto, Peru' on it (handy for Young Bond to follow their plan) but the tank never appears again. The city of Puerto is fictional - the name translates to 'port', despite there being no water or port anywhere near it. 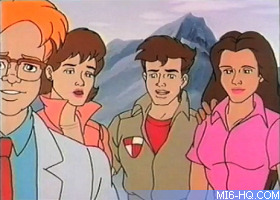 James Bond Jr: The detector is indicating gold up in those mountains. I'll go see if it 'pans' out. James Bond Jr: Goldfinger - wait!